Domenic and Mary Capaldi came from Italy to the United States. They found themselves planted in Pittsburgh. "My father was never happy in Pittsburgh," said Lou Capaldi, the youngest of Domenic's four sons. The young couple set out from there to find a fertile piece of property where they could carve out a living and nurture their family. The Capaldi's found their way to Port Norris, NJ. 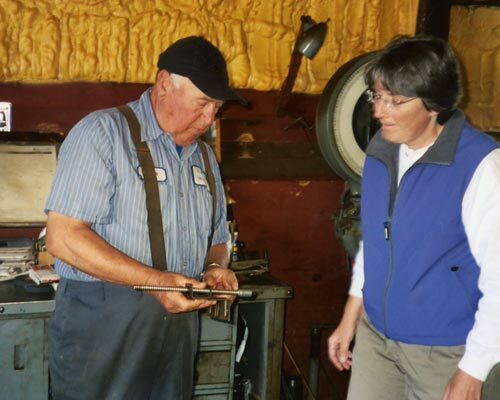 "We had one of the largest farms in the area," said Lou. He said that his family eventually owned several tracts of land, including some property that edged the Maurice River. At one time the Capaldi family owned 125 acres "upstream of Peak of the Moon". They employed as many as 150 farm laborers, many of them Italian immigrants who came from Philadelphia for the summer. "At our peak, we grew acres of beans and strawberries," said Capaldi. "That took a lot of help." The laborers lived in houses built on the farm property. Some of the workers lived there year round, helping with the farm crops in the summer and working the oysters in the winter. Without being cognizant of it, Lou Capaldi and his family were making their marks on the history of a very colorful region. Their high-ground farmlands, once the hunting and planting grounds for the Lenni Lenape, produced bushels of high-quality produce that was transported to other markets by freight train. The Capaldi property that bordered the Maurice River was diked or "banked," a method that transformed the Maurice River marshes into agricultural gold mines. The Capaldi's planted salt hay on some of these tracts. And they transformed one of their banked farms into a profit-making cranberry bog. Smart. Hard-working. Versatile. That's how Capaldi characterizes his father Domenic. "My father was a successful farmer. He always had his eyes open," Capaldi said. "I don’t believe he ever gambled a day in his life. He did not smoke a hundred dollar bill." These comments say something about his dad - and also about what was going on along the Maurice River during the early part of the 1900's. The oyster industry was bringing revenue - and interesting characters, into Port Norris. The few remaining old-timers still tell the fabled tale of men so rich that they smoked $100 bills like fine cigars. 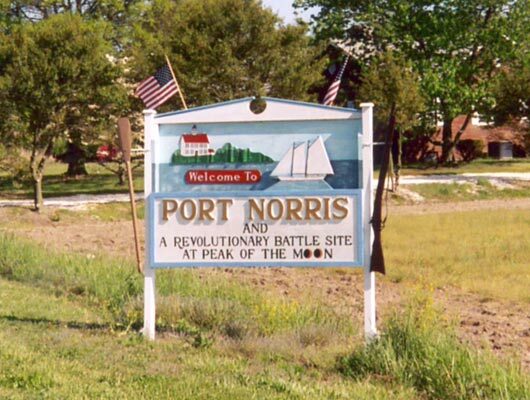 They also reminisce about the little racetrack that kept the buzz in Port Norris after working hours. This was the life when the region was known as the "Oyster Capital of the World." The Capaldi's did some oystering, too. They kept their boats at the dock next to where Long Reach Marina is now. "Except when we planted seed. Then we were docked at Money Island," Capaldi said. But mostly they farmed - and that's what Lou Capaldi remembers. "I remember one day when I was very young, 7 or so. My oldest brother drove me back a half a mile or so - down the road that leads from Haleyville where Mauricetown-Buckshutem Road is," Capaldi said. "Now today that's all mud and water. You'd never guess that there was even a farm there." That day the brothers were heading to the diked farm operated by Mr. Gandy, the string bean farmer. "He's credited with being the first to grow string beans in NJ," said Capaldi, adding that there was always something to learn from somebody else in those days. Farmers passed on their knowledge about the crops they were planting, about the methods they used to produce a better yield, or about more efficient ways to harvest their products. All of those lessons paid off for Capaldi. He's still farming the fields at Peak of the Moon. Capaldi looked back on his early farming experiences. "We were the lima bean kings," he declared. He was describing the family's 20-acre diked farm across from Leesburg. He recalled having the responsibility of counting the harvest one day. "By noon, they had picked over 600 bushels." He had bragging rights. "That ground - " he said, "there wasn’t a stone in it." He recalled how the enormous potatoes that grew there, too. "We couldn’t sell them, so we loaded them on a freight car - and they went away to make alcohol," he said, chuckling. "The land was so rich, but we were tired of putting up with the dikes," he admitted. The Capaldi's were probably among the last dike farmers on the lower reaches of the Maurice River. The dike that protected that tract of the Capaldi family farm finally fell, ending a very fertile era along the shores of the Maurice River. Dealing with the whims of Mother Nature and the forces of the Maurice River was a challenge for the farmers who worked the diked lands. But the river was part of the landscape and the farmers were adept at controlling the flow to provide irrigation and nutrients as needed. The river played an important role in the transportation of the local farmers' abundant crops, too. In the summer, vine-ripened Jersey tomatoes were loaded onto oyster boats bound for Camden and the nation's soup maker - Campbell's Soup. The Maurice River also provided a diversion from the long days of working the land. "When we got the oyster boat, we would take our friends out on Sundays," Capaldi said. He would go crabbing and fishing, too. "We never caught any fish, but we tried," he chuckled. For a young boy on the shore, the activity on the Maurice River captured his attention. Capaldi reminisced: "I'd be working in the fields at Peak of the Moon as a kid, when this big barge would come down the river." He explained that the barge was "loaded down with big logs" for the Bailey Basket Factory near Millville. "That was a treat for me," Capaldi said. He remembered that even as he got older, he would watch the river - just to see what would come around. "I'd be farming at the Peak of the Moon in the spring of the year." He recalled how the crew would put their sails up and try to come up the river. It wasn't always easy, Capaldi said. He would watch the maneuvers: "I would see them plow right into the banks because a captain and one mate couldn’t control a boat with sails. They would hit the bank, and then try to maneuver it off with the yawl boat. That was a sight." But a prettier sight was the Friday night flotilla of boats coming down river with their sails up. "Neil Johnson had pink sails. They stood out," Capaldi grinned. And on the first day of harvest, "everybody and his cousin would be down on the dock to visit the boats taking off. They'd have a crew of about 14 - 15 men each boat. They would come in from Delaware and Maryland." Capaldi remembered the crowds that came to watch the grand spectacle. He remembered “the ships with the sails catching the winds." Capaldi frequently headed out towards the bay for an adventure. He recalled traveling on foot to where the Range Lighthouse stood. He and his friend Frankie, a son of one of the farm laborers, often traveled together. "We were kids, tempted by the bayshore that was just two miles from here." That walk proved longer than they realized. During that journey to boyhood adventure, they had to cross the meadows and ford an intimidating creek. "But we got to the light house," Capaldi said, smiling. Capaldi described his impressions of the old light house, even though it was no longer in use. " The windows were knocked out, but it was sound with straight beautiful wood." He was 15 at the time, but he recalled that even at that age, he admired the woodwork. "All the boats used the range lights," Capaldi said. "And even if they didn’t, they used it to go in there to Basket Flats." He explained that a gut started there on the island which provided a short cut to the spot on the Maurice River where baskets of oysters were loaded and transported to higher ground. The light house was part of the history of the region. "One of the saddest things was when these young people went and burned down the lighthouse here," Capaldi said. Capaldi collected other memories as he grew up. 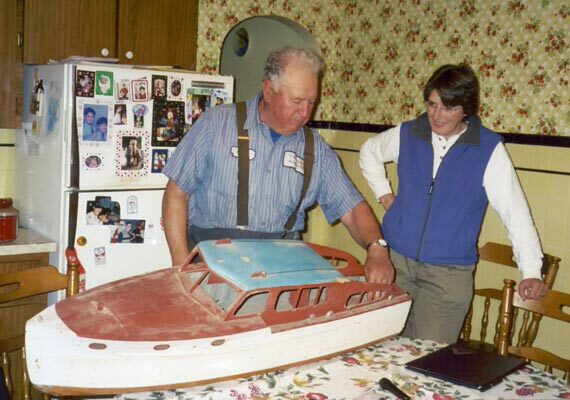 And he had his dreams: When he was 17 years old, he kept his eyes on the new boats that were being manufactured. "The Chriscraft was the Number-1 boat," he said. "The Cadillac of boats. It costs $1000 a foot back then." During those teenage years, he had a picture of the boat and a dream. “My desire was to have a boat like that someday,” he said. As if he could manufacture that reality, he set to work. “I cut ribs and planks, and I made a boat - by the picture. Fifty inches long." Capaldi's favorite reaction to his handiwork came from Doctor Sharp, who professed that Capaldi was "a mechanic." Capaldi still has that model he created. It's a bit nicked, but Capaldi proudly shows the details he incorporated into the wooden vessel, and says with affirmation, "Yes, this is My Desire." Capaldi is one of the folks who can spin a tale of the long-gone days. Some of that lore includes stories of the Native Americans who hunted and fished right there next to the river. On a high piece of ground on the family farm, Capaldi's brother gathered " piles" of arrowheads. Capaldi found a stone that was carved out. He learned that these were used for grinding meal. And he knew about "one of the Adams boys who was gunning one year - down here in the meadows" and came across what locals say was the skeleton of an Indian. The land factored into another era of history, Capaldi said. On the adjoining property, a Revolutionary War "incident" occurred. Capaldi can tell stories about another era - a time when men called rumrunners and a speakeasy kept the local law enforcement officials busy. It sounded like a Hollywood screenplay: fast boats that ducked past waterpatrols and officials that turned a blind eye to the illegal activity. Capaldi even related a tale about a local water tower that was used as a hiding place for the smuggled bottles of rum. "The law had their hands full at night,” Capaldi said. "This was a dry town. Rum running was big." There were other enterprising ways to make a living in the region, and there were some colorful characters who hoped to turn their ideas into profit. Capaldi related the story of such a character, a Mr. Fleetwood, who didn't let one bad experience stop him from trying something else. Capaldi set the scene: On the western shore of the Maurice River, nearly opposite of Leesburg and just north of the Cook farm, there was a swamp. It was well known that beneath the tannin waters were the preserved remnants of an ancient cedar forest. "Under this water were logs that were 5 feet in diameter," Capaldi said. "No one had ever seen things like that." Capaldi said a horrific storm knocked the cedars down hundreds of years ago. The logs were coated with layers of mud, which acted as a preservative. Capaldi said a Mr. Fleetwood, a rich gentleman from Millville who owned the Millville Iron Works, thought he'd hit on a great idea. "He figured he was gonna make wooden shingles out of these boards," Capaldi said "He invested a lot of money to get cranes to get them out and put up the saw mills to make them. But the wood was no good for this use.” The endeavor was a failure. That didn't stop Fleetwood from looking for opportunity, Capaldi said. Fleetwood got a few others to pull together and start a cattle ranch. "They bought land and put 25 cattle there. But every time they would go to count them, there would be one less - and then one less." Capaldi chuckled thinking about the cattle ranchers' naivete "Someone was taking them," he admitted. Capaldi described how the locals made their livings and provided for their families. He said that most learned to move along with the shifting tides of the economy. Dr. Sharp was a good example. "Doctor Sharp was a gentleman, a very nice man. He would come to your house. Sometimes he would charge you and sometimes he wouldn’t. But Dr. Sharp was very successful." Capaldi said that one day Dr. Sharp shared his secret with him. Capaldi said, "He told me one time, 'I don’t make any money as a doctor, I make my money in the oyster business'." And he made the right change when he needed to. "Doctor Sharp owned Del Bay," Capaldi said. "And when the oyster business went down, he turned it into a basket business." That was over 25 years ago, Capaldi remembers. Unfortunately, Capaldi said, competition from the southern factories ended that endeavor. Thinking back to his childhood, Capaldi said, "We didn’t want for nothing." When something wasn't working, his family set out in another direction. That's why, not long ago, he set out on yet another direction. Capaldi still farms the fields around Peak of the Moon. But in the garage where he tinkers with the tractors and keeps the farm equipment working, Capaldi started a new venture. Together with his nephew and niece, Capaldi started a small manufacturing operation to supply a specialized part to the casket factory that was "just down a way from Peak of the Moon." The Capaldi's scouted out some big pieces of machinery, brought them to the barn and tooled them to make a special metal piece that allows the undertaker to lift and lower the mattress inside the casket. The piece looks similar to the extension pieces used for a ratchet. Each casket needs four of the pieces made at the Capaldi shop. They make 10,000 parts on each run. "Thirty companies use our parts," Capaldi said. Capaldi is one of the long-time residents who has witnessed the changing landscape. The fleets of schooners with their grand sails no longer glide through the reaches. The farms no longer require barracks full of laborers. The meadows have been swallowed by the river. But there is a certain resiliency that comes with the turf. "When you are a farmer all your life, there aren't many things that you can’t do," Capaldi said.